Dr. Weiss and I have scheduled a presentation of Ethos Health CSA for Sunday, March 9th at 2pm at the farm in Long Valley. 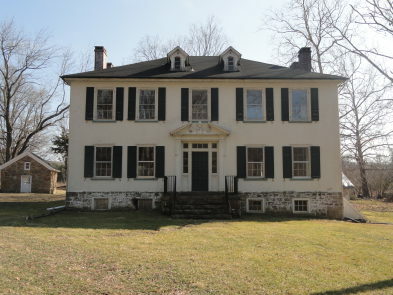 The 1836 Federal style house with historical preservation status is where we’ll hold the meeting. If we’re not knee-deep in snow, I’ll be happy to tour the farm with those who would like to look around and get a feel for the place. Ron will talk about food and how it heals us and his vision for the farm. I’ll tell you all about the CSA. You’ll be able to sign up for the season, if you’d like. Please pass this along to anyone you think might want to check it out. I think anyone interested in good food and good health will enjoy Dr. Weiss’ talk. In order to properly plan for the meeting, please let me know if you’ll be attending. I hope you can make it. I’m really looking forward to seeing everyone! The farm address is 177 W. Mill Rd. which is on Rt 513. The farm is about 5 min outside of Califon heading toward Long Valley. It is on the right, before you get into town. Depending on where you are in G.G., it’s probably 20 minutes or so from you. I am really interested, however I have an Event scheduled that day.